Many say home is where the heart is. You’ll want your home in tip-top condition, regardless of what you do with it. It’s a place to house your possessions, sleep, have guests, and other things. They’re a place to live your life by yourself or with your family. It’s a building that you want to take care of and have it last a long time to the point of giving it to your children or renting it out for other people to enjoy a happy life. In order to do that, though, you have to be aware of signs of wear and damage. A monthly checklist is a great way to prevent accidents in your home. This can help you avoid things like broken pipes, air ducts, weakened structure, and more. However, accidents can happen at any time, so it’s always a good idea to keep an eye out for signs. Occasional checking will alert you to signs that something may be amiss, including water damage. Water damage can be a pretty frightening thing to see on a surface. It’s pretty easy to spot, but you have to know what you’re looking for. There are plenty of things that can show water damage, like the big brown stains that appear on a ceiling or wall. However, some areas can be a bit harder to see and one might need to pay attention to more subtle signs. There are plenty of ways to see that water damage is going on in your house. 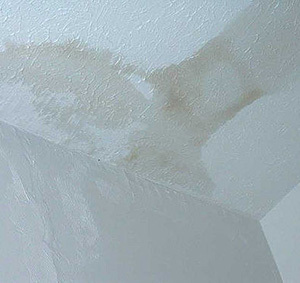 Water damage can get anywhere, from the ceiling to the floors. It can get on the walls or even in the insulation and structure boards. Water damage must be dealt with quickly, otherwise it can cause mold to grow. Mold can grow on any surface and cause a lot of health problems. Wood can be protected from water damage, but many other materials might not be so lucky. If your water damage is from contaminated water, though, it’s a different story. Blackwater is considered to be water that is touched with contamination. That includes floodwaters, groundwater, and sewage water. If the water damage is from any of these sources, the surfaces are unrecoverable. They must be taken out and discarded regardless of time. This is probably one of the most visible signs you can come across. When water damage leaks through, it darkens the area. If you’re asking “why is water damage brown”, it is because of the surfactant that helps bind paint to things. This chemical is brown, so whenever water goes through it, it brings surfactant to the surface. Either way, this is the biggest sign of water damage. Moisture causes this surfactant to reactivate and pools where the water is. Even if you dry it though, the stain will remain. Fortunately, you can paint over water damage stains. 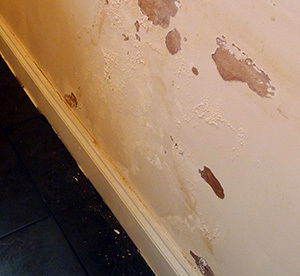 Changing surfaces is another sign of water damage. These changes can be warping like sagging or bending. It can also show bubbles, cracking, or even expansion of the surfaces. This is a visible sign that water has gotten into or beneath the paint of your drywall or plaster. It causes the surfaces to bloat with water, making it soften or crack beneath its own weight. While not a visual thing, smell can be just as big of a sign. Mold and mildew produce a very unique smell when it grows. With the spores in the air, the odor smells dirty and musty. This can cause respiratory problems for many people, especially those who are sensitive to mold. It can lead to other health problems like sickness and fatigue. Rust on pipes or other metals. Usually in basements, pipes that have rust are signs of water damage. When water runs over these metals, it oxidizes and creates the orange substance we call rust. Only water can cause this to occur, so if you see any, there is a leak somewhere. It is also possible that humidity can coat these pipes and lead to more rust, which can be solved with a dehumidifier. If any of these signs are seen, you shouldn’t wait to fix it. It doesn’t matter if it’s on the ceiling, walls, or flooring. The quicker you get to the water damage, the less likely you’ll grow mold. Mold is dangerous to anyone’s health, so don’t wait. The longer you wait, the worse it will be. Water damage is no joke, so be sure to get on it immediately. The best and most accurate way for you to find water damage in your home is via a moisture meter like this one. It can measure moisture in masonry, drywall, and most common building materials. If any surface is over 15% moisture, you likely already have serious issues that need to be addressed by a competent disaster restoration contractor that also does mold cleanup so you don't have to deal with multiple companies to get the job done. Your home is an important place. Even if you don’t stay in it very much, it’s a place to house your possessions. A person can live alone or raise a family in one. It’s a very sturdy thing that can last for years, but it is also subject to damage things. Water damage is a serious matter, so be aware of the signs that may pop up. These signs can be anything from smelling mildew and mold to seeing brown spots. They can be apparent, but if you smell mold, it might be too late. You may have to call a professional to help get rid of it. If you find it quickly, though, you can prevent the mold from growing. Water damage is hard to deal with, but affected surfaces and areas can be replaced.